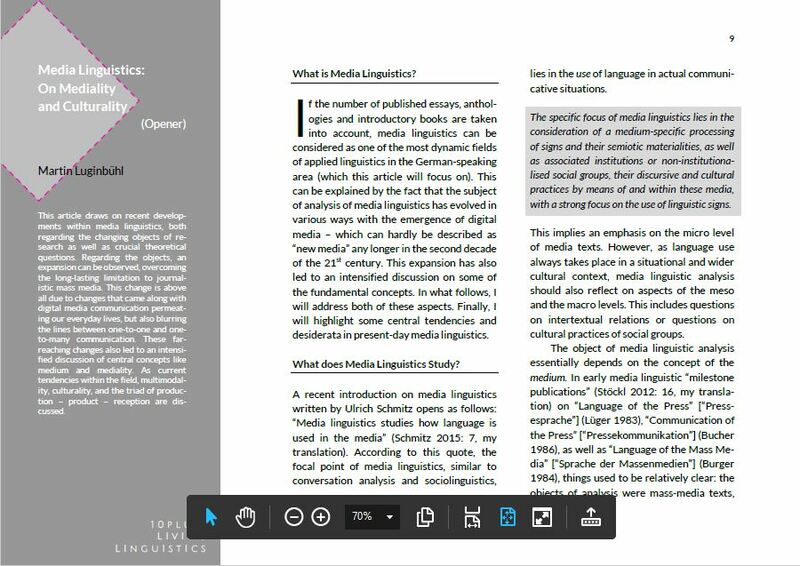 This article draws on recent developments within media linguistics, both regarding the changing objects of research as well as crucial theoretical questions. Regarding the objects, an expansion can be observed, overcoming the long-lasting limitation to journalistic mass media. This change is above all due to changes that came along with digital media communication permeating our everyday lives, but also blurring the lines between one-to-one and one-to-many communication. These far-reaching changes also led to an intensified discussion of central concepts like medium and mediality. As current tendencies within the field, multimodality, culturality, and the triad of production – product – reception are discussed. Martin Luginbühl is Full Professor for German Linguistics at the University of Neuchâtel, Switzerland. His current research focuses on media linguistics, genre studies, conversational analysis and language and culture. In 2014 he published the book Medienkultur und Medienlinguistik [Media Culture and Media Linguistics] (Peter Lang Publishers), a genre based comparison of the American “CBS Evening News” and the Swiss TV news show “Tagesschau” from the 1950s until today. He is co-author of the book Mediensprache. Eine Einführung in Sprache und Kommunikationsformen der Massenmedien [Media Language. An Introduction into language and genres of mass media] (de Gruyter) together with Harald Burger.